What do you have for June Bugs? They keep flying around my deck light. Must be 25-50 every night. Some are green and some brown. And I see them dead on the ground all around my patio and back yard. 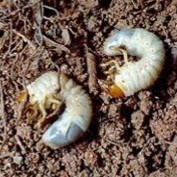 I think they’re living in my grass too because I find white grubs in some of the dirt when digging holes for our flowers and shrubs. 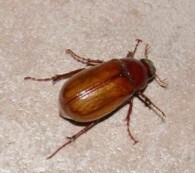 June bugs are active from early spring through summer as adults but its the larval stage that does the most damage. No doubt the ones you’re seeing around your deck light are a nuisance. They’re mostly males seeking females. But the real problem is somewhere on your property and most likely in the yard. Now after 4-8 weeks of chomping away under ground, the larvae will pupate. 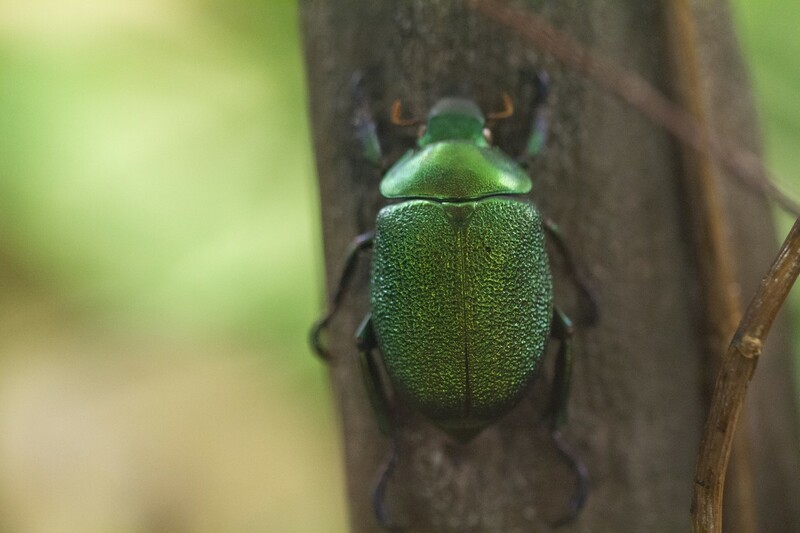 This is the stage that lets them molt from grubs to adult beetles. Larvae which pupate early enough will emerge in late in the summer. This commonly happens in the southern region allowing for two cycles to progress annually. Pupae developing too late in the year will wait to the following spring to emerge once local temps in your area drop with the arrival of winter. But in many states south of Kentucky and Virginia, larvae can and will feed throughout the winter when given the chance. This typically happens during mild winters and in fact is a great time to treat. 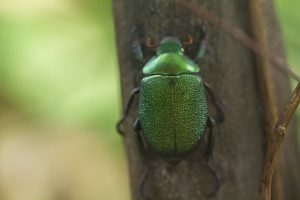 To control both adult and developing June Bugs, simply spray the yard, flowers and bushes with ADONIS. This non repellent concentrate won’t kill them quickly but this is by design. So for any landing on the treated grass or plants, it will take 2-3 days for them die. Be sure to spray around all the lights they’re using too as this treatment will kill the ones going there too. When using a standard PUMP SPRAYER, mix 1 oz per gallon of water and plan on getting 1000-2000 sq/ft of coverage per mixed gallon. One treatment per season is usually enough but if you treat in March or April and live in a warm climate, treat again in October or November to ensure complete protection for the whole year. To treat a yard 5,000 sq/ft or more, use a good HOSE END SPRAYER. 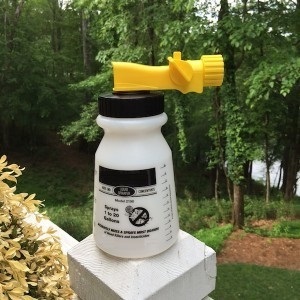 Using our sprayer, you’ll need to add 2.5 oz and then water filling it to the 5 gallon mark on the side. Next, hook it up to your garden hose and spray the entire contents over 5,000 sq/ft of turf. 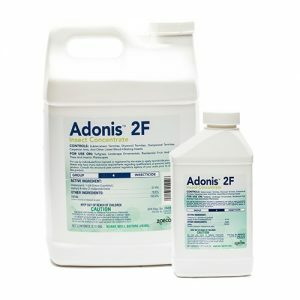 This is generally the best way to apply Adonis since it needs to work its way down into the soil so it can truly work like a systemic. Normal rain will get this done or if you irrigate your yard that will help too. But this process will take 3-5 weeks and relies on rain/water. The small jug will cover almost an acre but larger sizes are available too. Something else you might consider installing in our FISH LIGHT. This device can be set off your deck or porch. Designed to “mulch” bugs into your favorite fishing hole, the Fish Light uses a weed whacker cord to “grind” up unsuspecting moths, wasps and beetles attracted to light. Its a great way to pull in and kill foraging pests from the area. 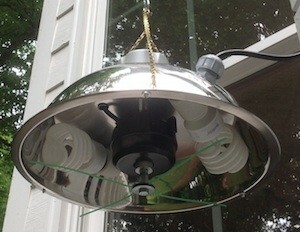 During the summer, running it every 2-3 nights will help minimize bugs normally attracted to light.